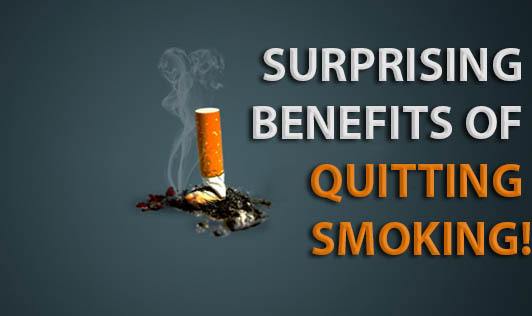 Surprising Benefits of Quitting Smoking! Everyone knows that smoking is injurious to health. Even then, quitting the habit is not easy because of the addictive nature of nicotine. However, it is not impossible. Motivating yourself and having a strong will power will go a long way when it comes to quitting the smokes. Whiter teeth: Tobacco makes your teeth yellow in color. Giving up the habit will make your teeth whiter, giving you a better smile! Fresh breath: Many people may not have told you, but every smoker's breath smells of cigarettes and not many people like this. Quitting smoking will give you fresh breath making you more acceptable in social groups. No more cough! : The irritating, chronic cough also called as "smoker's cough" will be gone after a week of keeping away from tobacco. Food tastes better: Taste and smell receptors are improved when you quit smoking. This makes it easier for you to experience the actual flavor of the food you eat. Low stress: Quitting the habit of smoking has been found to reduce stress levels of individuals. It also increases the oxygen supply to the brain which, in turn, increases mental wellbeing. Increased energy: Energy levels increase when you quit smoking, making physical activity easier. It also improves immunity making you less prone to infections. Better skin: Smoking speeds up the process of aging. So, naturally, quitting will reduce wrinkles and other signs of aging, giving you a younger look. You save money! : Do you know how much money you spend on cigarettes? Calculate it for a month and you will see how much you are wasting by burning tobacco and paper. You could save up the money for something more useful! Now that you know the benefits of kicking the habit, have you thrown your cigarettes yet? ?